Although we have no availability remaining for 2017, please send inquiries for 2018. 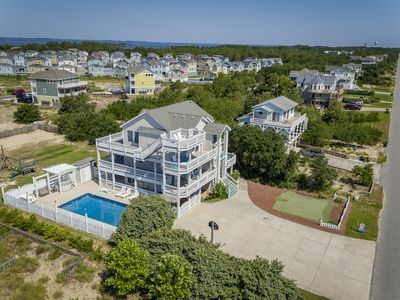 Swimming, hiking, crabbing, or just relaxing this house has all these activities and more. 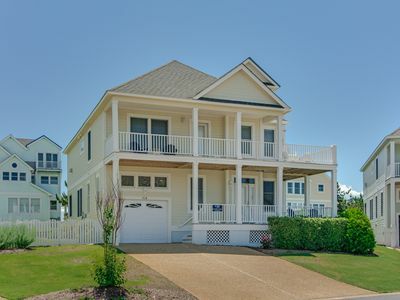 Sit on the front porch and watch the pine trees sway or go for a bike ride along the sound. 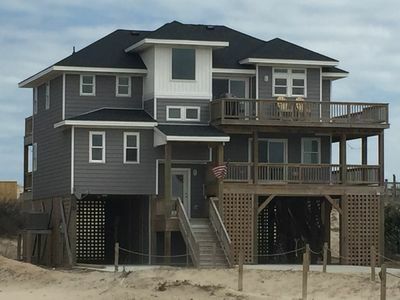 This home is located Sound side in Corolla Light, winner of the North Carolina Resort Community of the year award for seven consecutive years. 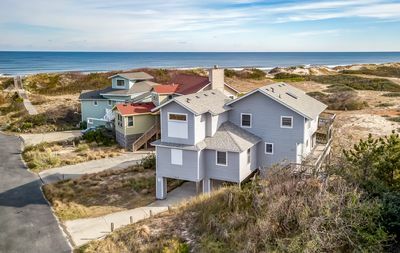 This is the only resort on the Outer Banks that offers activities for the whole family and one of the few beaches that provide lifeguards. 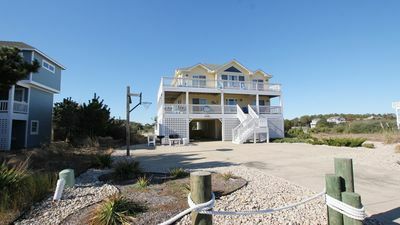 Amenities in the resort include 3 oceanfront pools complete with a clubhouse that offers dining; play areas (basketball, volley ball, shuffleboard, arcade and kids playground area), extensive activities for children, snack hut, 1 sound side pool, and Indoor Sports Complex complete with Olympic size pool, indoor clay tennis courts, racquetball, large indoor hot tub, full weight room, walleyball court and a stocked fishing pond. There is also a trolley that provides free transportation throughout the resort during in season weeks. All these amenities are included with rental of the house by wearing wristbands provided to a maximum of 12 guests. 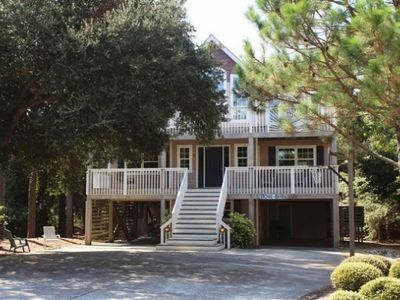 This house is just steps away from the Indoor Sports Complex for rainy days. 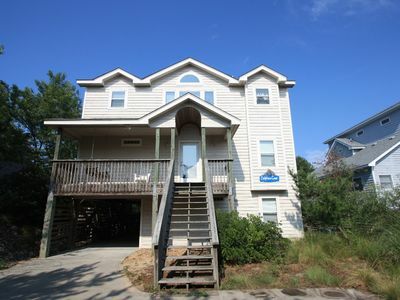 Sound access is a two minute walk to the pier (great for crabbing), fishing pond and nature trails. 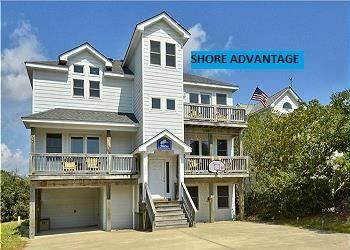 Ocean access is approximately a five minute walk or two minute drive to the beach access. 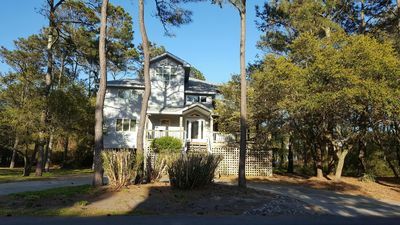 8 bikes are provided to ride to the Whalehead Club and the Corolla Lighthouse (both open for public tours) or anywhere on the island’s bike paths. 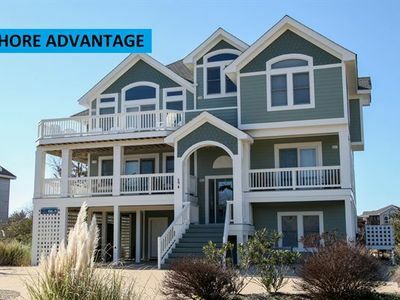 Guests are entitled to reduced rates at 3 top rated golf courses located on the island. 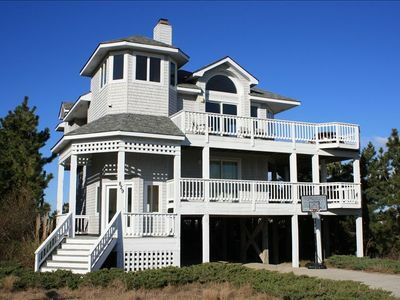 This is a great house for golfing couples any season. Don’t miss the wild horses located within 3 miles on the beach accessible by 4 wheel drive. 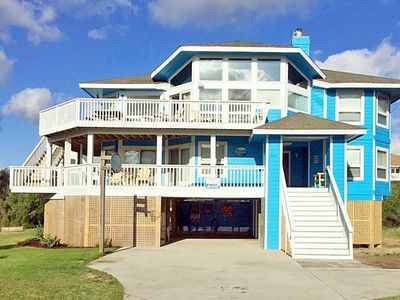 The design of this house is perfect for all generations vacationing together. 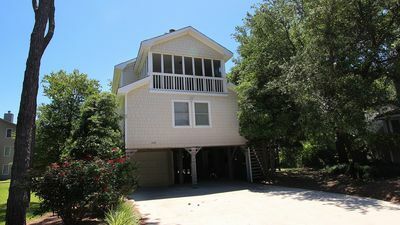 The upper level has a king master bedroom with private access to the 7 person hot tub inside a screened porch. The open kitchen, dining room, living room and ships watch makes a great meeting place for the entire crowd complete with 50' TV. HBO, Cinamax and Showtime surround sound inside and out, BluRay player, gas fireplace, games, puzzles and over 100 movies. 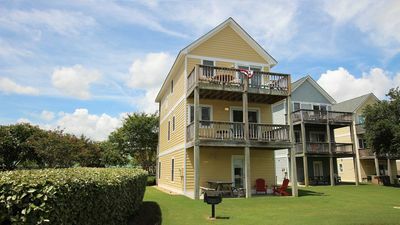 The upper deck also has a half bath, screened-in porch off the dining room, access to the spa and Weber gas grill. The mid level has a queen master bedroom, a queen bedroom that shares a bath with 2 sets of bunk beds, a sitting area with TV and computer . 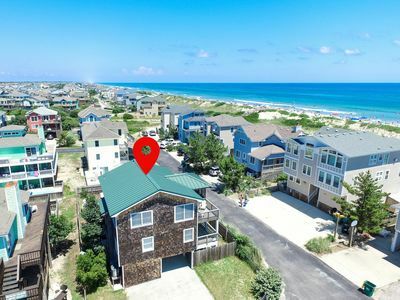 Lower level has a rec room with smart TV, Blu Ray, surround system, stereo, extra refrigerator, sofa, pub table w/stools, twin bedroom and full bath. Private salt water pool (No more stinging eyes, dry skin, fading swimming suits or chlorine smell). 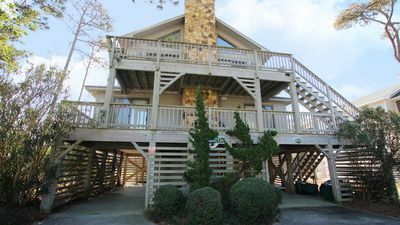 Stereo system and a picnic table make this area perfect for eating crabs or having a cook out under the shade of the pines. 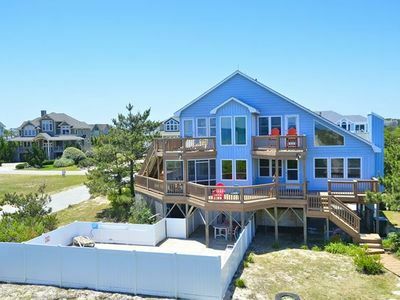 Wrap around decks lead from one level to another with chairs, rockers, swing and hammock to enjoy the tranquil sound side of the beach and the quiet cul-de-sac this house is located on. C7115 The Diane Marie. 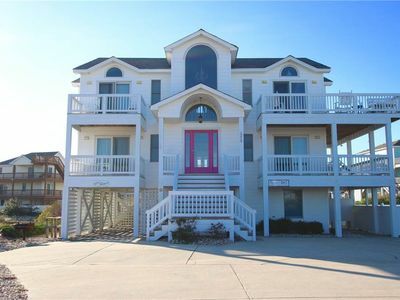 Semi-Oceanfront, Saltwater Pool, Hot Tub, Linens! C0131 Crowe's Nest. 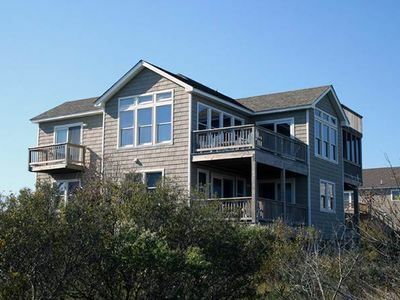 Sec E, Unobstructed Ocean Views, PETS OK, Hot Tub, WiFi! !